Pembroke picked up their first Leinster league title in four years as they eased by Monkstown to get the point they needed to keep out of reach of Glenanne. The win was pretty much wrapped up inside 12 minutes as Craig Fulton got the simplest of deflections to Conor Harte’s free-in and Maurice Elliott’s tapping in after Mick O’Connor stole the ball on halfway and broke 45-metres, ending up two-on-one with David Fitzgerald. Elliott hit the post soon after before Gareth Watkins was denied a promising advantage which would have constituted the Town’s best chance of the match. From then on, Pembroke were rarely threatened and when Alan Sothern netted a corner in the 30th minute, the game was truly up. Justin Sherriff did superbly to outfox Fitzgerald on the endline to set up Sothern for a simple finish in the second half before Paddy Conlon completed the rout, getting on the end of an outstanding Craig Fulton 60-metre pass. It was a suitably dominant way to complete the league title and a second piece of silverware in five days. There will be concerns, though, over the fitness of O’Connor, Sherriff and captain Alan Giles who all have niggly injuries ahead of next week’s Irish Senior Cup final. 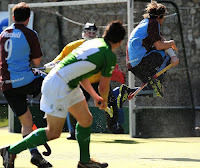 Giles sat out the Monkstown game but, while his side may have bigger fish to fry in the coming weeks, he insists there was no lack of motivation in the wake of the EuroHockey Club Trophy victory. “When you come off a high like that, it can be hard to pick yourself back but we let the league slip through our fingers last season so that was the motivation we needed to get us back up for this one. Meanwhile, Ray O’Connor’s last match passed off without any major controversy – usually the mark of a well-managed game from an umpire’s point of view – with just Brian Groves’ green card making into his notebook. Gordon Watkins presented the umpire with a commemorative piece of chrystal to O’Connor after the game for his incredible contribution to Irish hockey. Elsewhere, all the league placings remained as they were prior to the day’s action. Glenanne retained second place with a comfortable 4-0 win over Three Rock Rovers and so will receive an extra home game in next season’s IHL. Johnny Goulding scored before half-time before Stephen Butler’s double and one from Shane O’Donoghue did the damage. The game was also marked by an appearance from Rovers club captain Cedric Christie in an effort to raise money for the club’s Caroline Ryan appeal – the club’s physical trainer who requires specialist treatment for cancer in America. Corinthian won the battle for the wildcard place as they got the win they needed to stay ahead of Fingal on goal difference, though not without a couple of scare from UCD. The students were within a goal of the reds in the second half before they tired in the face of a zippy Corinthian performance pulled clear in the latter stages. It meant Fingal’s lively 7-3 win over Railway was purely academic with Trevor Parsons netting a hat-trick while Leinster U-16 player Kevin Wong got his second senior goal for the club. The game was preceded by a minute’s silence following the passing of Des Byrne, the Railway stalwart and former Leinster Branch president. The relegation issue was resolved by YMCA as they beat Kilkenny 6-2, thanks in the main to Richie Pedreschi’s hat-trick, warming up nicely for Sunday’s interprovincial series. It meant Kilkenny go down to division two after two years in the top-flight. UCD, meanwhile, will have a feisty battle with Bray to contend with, especially in light of Tuesday night’s match with Clontarf which was played at what equated to a decent division one pace. In division two, Avoca’s match with Navan was postponed due to the junior interpros while Trinity finished on a high with a 6-2 win over Suttonians. Chris Tyrell scored against his former club while Ben Hewitt netted a hat-trick in what may be his last game for the club. The Bangor man looks set to be unavailable for the club’s Neville Davin showdown with Clontarf.